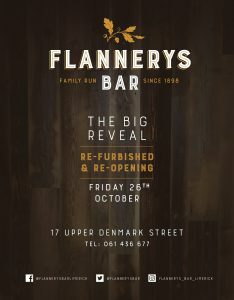 A premium and stylish offering steeped in the history of a family business will await customers of Limerick’s Flannery’s Bar on Upper Denmark Street when the bar reopens on this Friday 26th October following a redesign and extensive renovations. As the final refurbishment work continues within the bar surrounds, Liam explains that the move was sparked by looking to cater more for the needs of the weekend orientated drinkers and visitors to the City. The brothers know that their customer base is looking for more luxury and their choice of drinks now reflects this with an extensive selection of cocktails, gins and long drinks on offer. Now, Limerick’s social scene will be offered a premium setting after inspired visits to London and New York led the brothers to focus on their father’s history in Irish Whiskey and Guinness bottling. The overall look and theme for the new design will lean back to the family’s historic links to the bottling trade where Liam and Seamus’ father Michael was an authorised bottler for both Jameson and Guinness in his William Street premises. Inspired by the sophistication and history associated with Irish Whiskey, Liam Flannery said that these links with his father’s work as an authorised Jameson bottler animated the direction for the new design. “The refurbishment will see a beautiful new outdoor area built upstairs and we have moved some walls and screens to give us more seated booth space in a garden-feel environment” Seamus added. The first floor bar has also been increased in size and overhauled with a view to hosting large groups and events.As the final touches are put in place, earthy tones will pave a way for Limerick’s newest designed bar that will be cast in luxurious materials.A distillery theme will adorn the new soft industrial space across a number of levels. Exposed stone walls and brick will encompass seating booths cased in steel and oak timbers. With one of the biggest Irish whiskey collections outside of Dublin, the small Traditional Bar in Flannery’s will cater to your every whim and the 140 bottle whiskey collection is one of the showstoppers of the Limerick city premises.The bar even offers a Whiskey Bible that lists all the Irish whiskeys for sale accompanied with tasting notes along with a history of the pub and the Flannery family.Bespoke Irish Whiskey Tastings are regularly offered to corporate groups and parties and bring participants on a journey through the ages and tastes of Irish Whiskey. “We will talk you through the whiskey process and our own history on how we have come along and evolved with it as well”. The fully refurbished bar will reopen this Friday October 26. 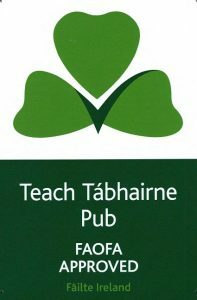 Michael Flannery’s Bar is located at 17 Upper Denmark Street, Limerick. Operated by brothers Liam and Seamus Flannery, the city bar offers a late night venue on Thursday Friday and Saturday with a variety of drinks and food options for parties, groups or the discerning customer alike. 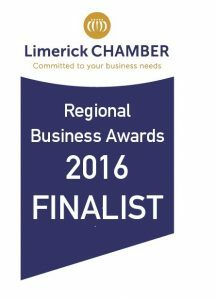 Contact Flannery’s on 061 43 66 77 (Option 5 for Office) or info@flannerysbar.ie for more information.